How does new media influence the cultural development of the society and which influence do they have on the identity of a society? Which possibilities of knowledge to they open up and which risks are involved? 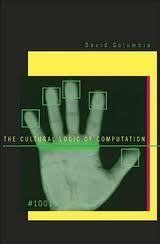 The Cultural Logic of Computation by David Golumbia sides with the technology and culture criticizers. He fosters the fear that the society delegates too much responsibility to the computers and thus the sovereign way of thinking gets lost. For example you can say that someone who mistrusts his own memory and education, so that he has to assure almost every time by using search engines and correction software, is being dominated by artificial intelligence rather then dominating them. The deification of computers or even just the dependency on them leads to an inescapable faulty fixation of the society. Instead of getting involved with the own hierarchy of values and speed of communication the western culture is looking forward excitedly to the next step of development towards the information technology. Due to this the humanity is slowly converting to a slave of a simple rational system of thought that David Golumbia calls “computationalism”. Furthermore the humanity unlearns the formulation and realization of their own needs. From the point of view of Golumbia this trend, which is already working in all digital fields, is moving towards a neoliberal ideology. Considering the globalization this ideology concentrates only on territorial-, benefit-, control- and capital maximization. In addition to that the human degenerates through the increasing technification of its living environment. In an interview with a well-known German newspaper Golumbia states that especially institutions, corporations and government agencies empower through these digital changes. The belief that humans empower and due to this the institutions have to lose power is a widely spread false assumption. However it is the other way round: The Mass empowers but concerns and governments proportionately empower much more. As David Golumbia is influenced by the marxist way of thinking he is convinced that people with other approaches run the risk of being influenced by conservatives positions in the course of digital changes. He clarifies this statement with an example of Apple. Many left-wing fans of Apple can identify with this company as it is sensed as creative and uncomplicated. However it is well-known that Apple is an authoritarian company which keeps shtum about intern operational procedures. Taking into consideration that even devices from this specific company contribute to change the world he claims to keep in mind that it is not an computer task to convert the world into a better place. The people are concentrating too much where the technology takes them too instead of asking themselves where they want to go. “Computationalism” makes it easier to exploit large parts of the world, acquire resources and even control whole areas, explains Golumbia. This awareness comes directly from the past politics of imperial leaders which weak points were communication and control. Nowadays it is no problem at all to control others from the other side of the world within seconds. Meanwhile David Golumbia uses the expression “computationalism” to indicate many positions but especially for those which regard the brain and language as computer-like. He compares the mind and language with computers. A well-known artificial intelligence scientist like Ray Kurzweil even assumes that the human brain is a computer. Computationalism has an enormous influence on peoples life and the way how humans integrate in the society. David Golumbia developed software for banks and stock exchanges. One of his main projects was the development of a software for investment banker, which made it possible to show better results. In the meantime he is regarded as one of the strongest criticizers concerning digital change. In 2003 he continued his career as an English, media studies and linguistic professor at the University of Virgina. Title: The Cultural Logic of Computation.